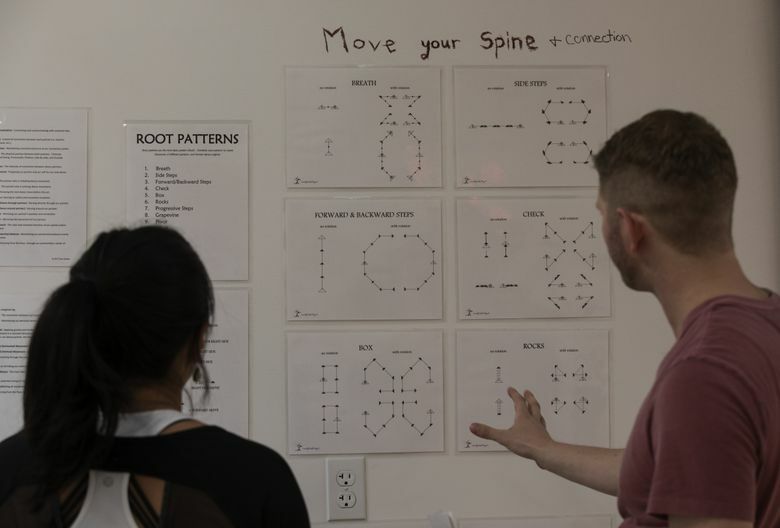 An introductory session at Flow Studios focuses on music, the floor and connection. I CAN HEAR the beat in music. I can move to music. I can follow someone else guiding me through a dance. But ask me to lead moves on the dance floor? I might have a smile on my face, but my insides will be churning. 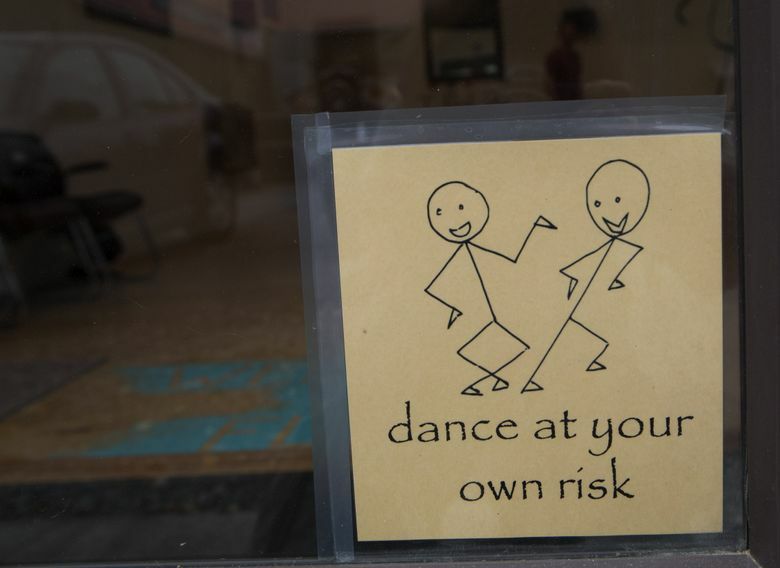 I went to Flow Studios, a Seattle dance studio that specializes in helping people understand the fundamentals of dance so they can dance with a partner to any kind of music, anywhere. I took a 30-minute introductory class with owner Michael Haug. 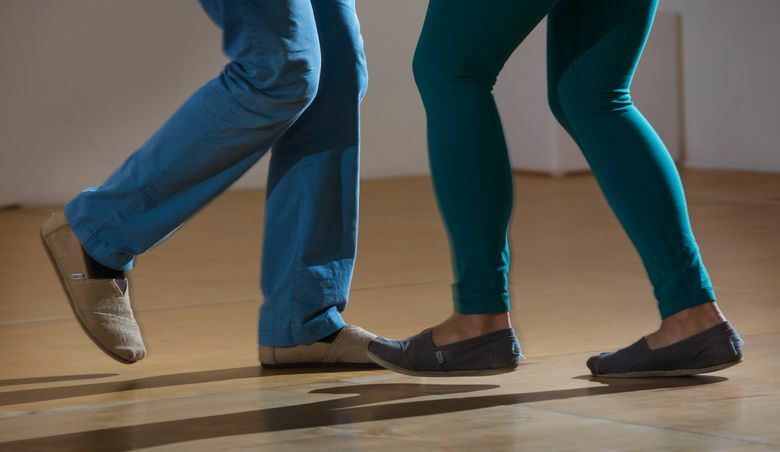 Haug teaches three main components of dancing with a partner: music, the floor and connection. We started with connection, doing a “hand dance,” with palms connected and eyes closed. First, he led me through, moving his hands in different directions, me following along. Then, he had me lead. This part I was OK with: moving my hands in funny formations. Next came our relationship with the floor. He had me practice bringing all of my weight to one foot at a time, moving side-to-side. He added in counting to the music, taking four counts to move from my right foot to my left, then two counts, then one. We did this to a song with a strong thumping beat, which was easy to follow. When we sped up, I suddenly was dancing. We practiced with a plastic frame positioned between us to work on moving in partnership, and noticing which direction the other person was going. We moved on to hands on shoulders, noticing shifts in direction forward and back. Finally, I was ready for a standard dance frame, with my left arm on his shoulder and my right hand in his. Haug had me close my eyes so I could pay attention to how he was directing me around the floor. Then, it was my turn to lead. Haug said he teaches all students to be a leader and a follower. I am good with leading in many other circumstances. In dance? I was awkward as can be. But Haug said it was the best time to make mistakes, so I went for it. I started simply, going forward and back, but then decided to have him do a spin. Luckily, he went with it. We kept passing lead back and forth to songs with different beats, including one that had a merengue feel. The more I led, the more I loosened up, changing between the standard dance frame to holding hands, to trying to spin both of us out and back. Sometimes, I tried to transition too abruptly, moving backward to forward or changing direction. Haug said to think of it like braking slowly, or slamming on the brakes. You want the former. We also stepped on each other’s feet. This is also normal, Haug said. Suddenly, the half-hour was up. The next step would be to go to a few more classes to get proficient. Even people who are reluctant to dance like this style, he said, because they don’t have to follow any steps; they get to make it up as they go along. He works with a lot of couples preparing for weddings. Flow Studios lives between formal social-dance classes, which I love but have never mastered, and completely unstructured dancing. I like this middle place, where you figure out how to move without needing to memorize anything. You get to decide. Over time, you learn more complicated dance moves, to whatever music inspires you. I’m down.